Capable of decoding 2,000 scans per second in real time, the MS-911 delivers a decode rate unmatched among small fixed mount scanners. Meet the world's fastest compact fixed position barcode scanner. Capable of decoding 2, 000 scans per second in real time, the MS-911 delivers a decode rate unmatched among small fixed mount scanners. Ideal for high speed applications, the MS-911's superior processing also benefits other applications by providing multiple looks at a given label, which ensures good reads. This versatile scanner reads all standard barcodes as well as OMR (optical mark recognition). Easily integrated into existing machinery, the MS-911's ultra-compact size and shape allow for flexible mounting and positioning. Although designed to meet the requirements of high speed processing, the MS-911 offers broad market appeal to many industries. 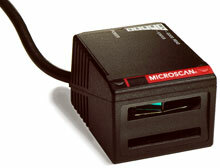 The Microscan FIS-0911-0002G is also known as Microscan Systems	FIS-0911-0002G	or FIS09110002G	.